Our tenth challenge was all about fruit; we didn’t care if it was fresh, dried, tinned, flesh, juice, flavour, extract, or anything - if it contained a particle of fruit it was in! We mooted long and hard about whether coconut qualified for a fruit – we decided it was because it’s not a nut and it certainly isn’t a vegetable, and supermarkets place it in the fruit section. 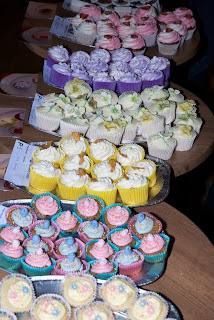 The standard, as always, was stunning and our 25 amateur entries and 7 professional entries amounted to a veritable banquet of fruity cupcake goodness. 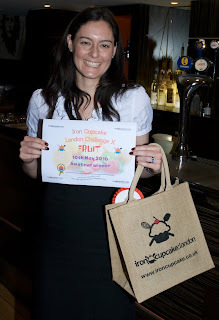 We have a first in an Iron Cupcake London post – a situations vacant advert! 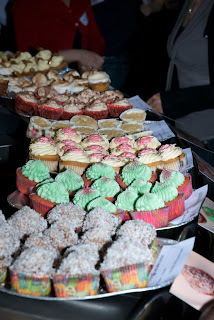 If you are interested in a cupcake and baking related job make sure you check out the write up for Mellissa’s cupcake. Unlike other recruitment consultants, I shan’t be charging a fee should I find Mellissa some staff! Here's Mellissa on the right; if you're lucky, she could be your future boss! 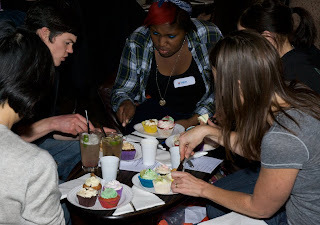 In what Max (my nephew, who greets most of you at the entrance and has an encyclopaedic knowledge of Iron Cupcake London entries past and present) terms “Iron Cupcake Spirit” (ICS) we tasted all the entries, even if we don’t usually like the flavours involved. I love ICS as it challenges my prejudices and makes me discover the joys of flavours I thought I didn’t like! 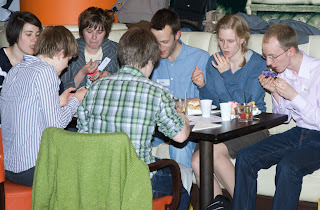 All attendees take eating and judging very seriously...and rightly so! So much to appreciate here! Kelly’s light vanilla sponge was tinged red and she included chocolate chips so that it looked just like a piece of watermelon; it also included melon pudding. The frosting was also amazing - Kelly brought watermelon syrup back from the States and it had such an intense fruitiness to it that kept piling flavour into your mouth. 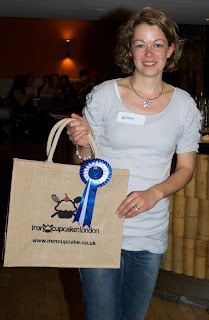 I have to confess that I was delighted Kelly won because, aside from her awesome cupcakes, she is our only baker who has entered every Iron Cupcake London competition – tenth time lucky! Well done Kelly on these masterpieces in cupcake form! Andrea’s combination of cinnamon and peach was new to me and it worked so well that I wondered why it wasn’t used more often. Her light and airy cinnamon sponge contained cinnamon and peach compote that was delicate and delicious; the frosting was cinnamon cream cheese. 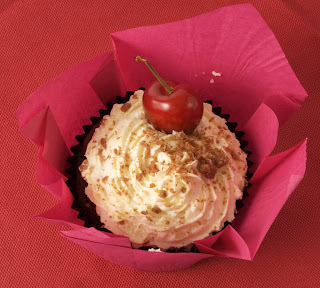 The peach was subtle and came through after the cinnamon – very delicious indeed! 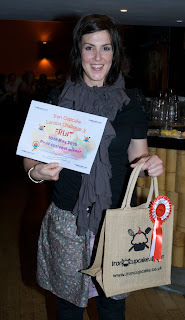 Eloise is our most decorated Iron Cupcake London baker and, if my memory serves me correctly, this is her FOURTH title! Tayberry tastes like a cross between blackberry and raspberry and has a novel, yet at the same time familiar, taste. 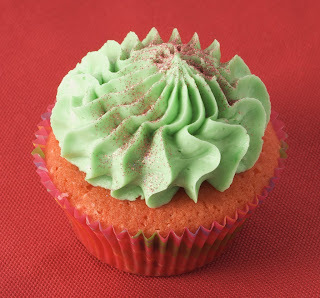 The lovely vanilla sponge was topped with the fruity swirl frosting that was light and whipped. Ying, one of my trusty helpers and co-eaters oohed and ahhed over the beautiful lilac/purple hue of the cake. A deserved winner as it was as tasty as it was stunning. 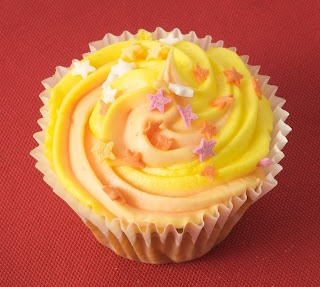 Kerry’s lemon drizzle cake was topped with an orange cream cheese frosting. The sugary crust of the cake provided some lovely texture and the cream cheese frosting worked particularly well with the zingy citrus flavours. 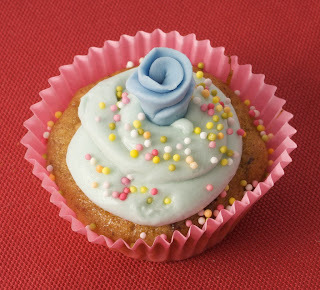 This cupcake was very refreshing to eat and it’s always nice to see a classic flavour combination grab the votes! Gem put together one of my favourite flavour combinations here – it had that creamy coconut taste of a Bounty bar. 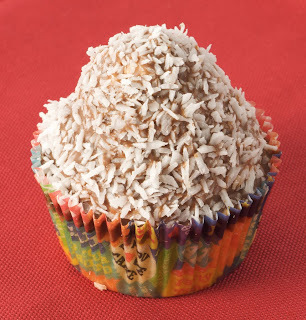 The coconut buttercream has to be one of the best buttercreams I’ve ever tasted and, luckily, Gem piled it high. Subtle hint: Gem, if you wish to share the recipe I will be eternally grateful! Fiona’s earl grey and blueberry combination was delicate and flavoursome – the early grey was in both the sponge and buttercream, the blueberries were only in the sponge. The fragrance of the earl grey hit first then the fruitiness came through. I found this an imaginative and beautiful combination. 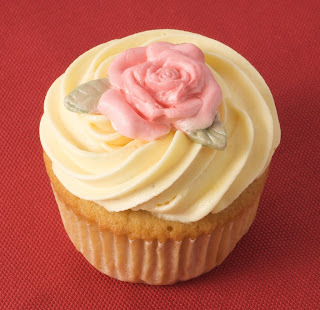 The lustrous little roses topping each cupcake completed the look perfectly – I loved the girliness of these cakes. Charlotte created an ‘inverted cheesecake’ here, practically a cheesecake tatin (humour me!). The sweet strawberries were on the bottom, topped with rich cheesecake with the biscuit ‘base’ on top! Having it upside down did alter the way the flavour hit and I found it a great success. Tamara’s chocolate sponge was topped with strawberries and cream with a dusting of chocolate flake. The cocoa hit came first then the palate cleansing fruit and cream. Max, my co-eater, turned to me and said “these are gorgeous”. I can’t add anything to that! 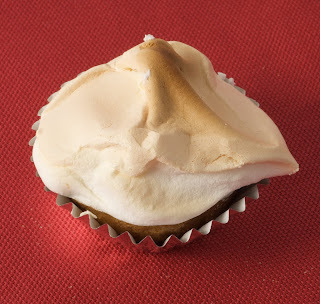 Gill went for a classic combination – sponge base, lemon curd and meringue topping. Her crisp meringue made a lovely crunch sound when you pushed your fork into it and the lemon wasn’t too sour, nor too sweet. A masterclass in a classic dessert! Kirsten put so much work into these beautiful cupcakes. The sponge was gooseberry and elderflower and contained gooseberry curd (which was divine – why don’t we see gooseberry curd as often as lemon curd?) and her delicate little shortbread biscuit sat above a gorgeous swirl of frosting. 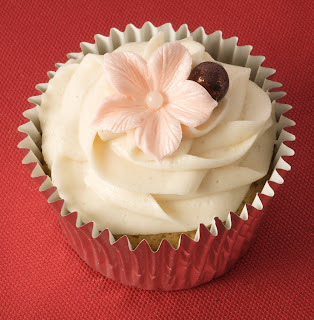 The flavour was light and refreshing and it was like eating summer in a cupcake! Shereen’s cupcakes were like eating a cocktail i.e. very, very good! 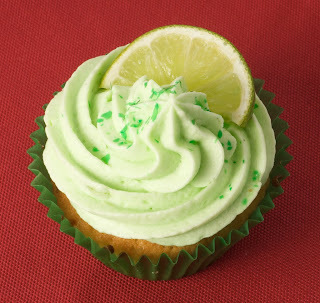 Her lime sponge was zingy and fruity and topped with a margarita frosting; it was so clever as you got the hit of lime, then the kick of salt and then – whoosh – in came the tequila! Packed with flavour. As a self-diagnosed ‘stickytoffee addict’ I couldn’t wait to tuck into Ann’s stunning looking cupcakes…and they didn’t disappoint! The rich toffee sponge managed to be both sticky and light and the whipped frosting was the sort of thing I will find myself dreaming about in hungry moments! And for any of you asking the question I was asked several times on the night, the answer is “dates”. 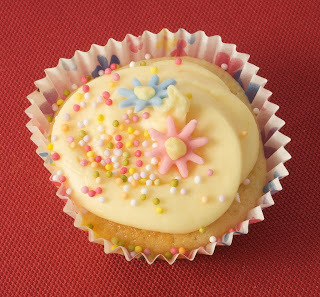 Ankhelitza, ably assisted by her lovely mum, brought us these beautiful creamy cupcakes. The chocolate sponge contained little pockets of sticky morello cherries and this was teamed with kirsch cream filling and a vanilla cream topping. I, for one, certainly appreciated how generous Ankhelitza was with the cream! 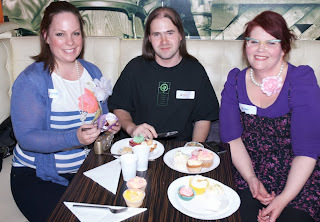 Jack’s cupcakes were heavenly and you could taste all three flavours. I loved the addition of clotted cream; I’ve baked using double cream before but never clotted and it was amazing – so rich and satisfying. 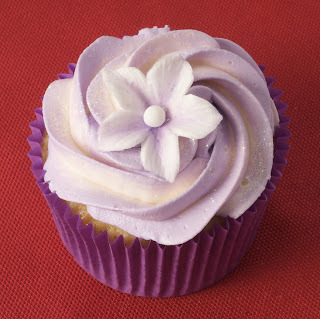 The blackcurrant frosting was intense and I just loved the overall taste of the cupcake. 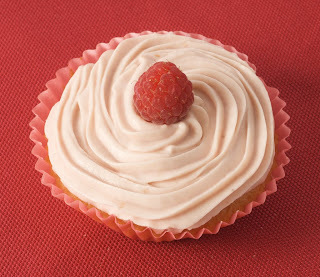 Kathryn used raspberry in both her sponge and her white chocolate cheesecake frosting. NB. 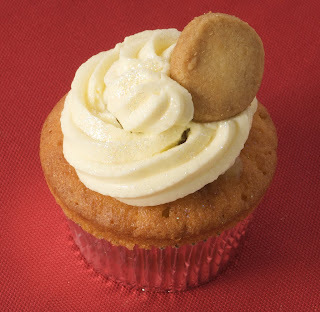 If you have just read the words “white chocolate cheesecake frosting” without drooling, feel ashamed…very ashamed! 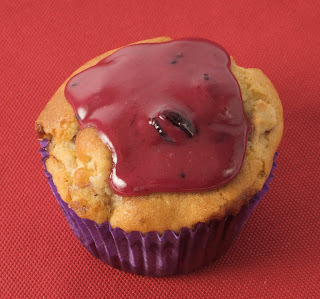 The frosting was incredibly smooth and retained the sharp edge of the cheese which worked very well with the raspberry. I was so pleased Elizabeth managed to enter – she was up from Wales visiting friends and, having followed the event on line, was finally able to take part. Lucky us! 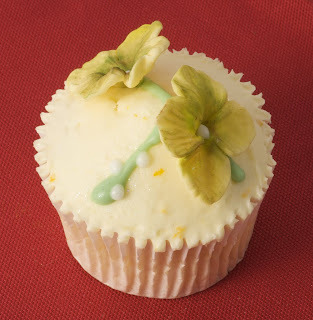 The orange sponge had a limoncello centre and the orange and lemon “cream cheese” frosting was tangy and flavourful. I say “cream cheese” because Elizabeth’s entry was vegan. 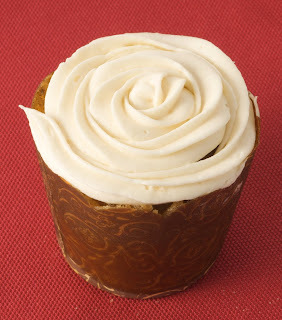 Rosalyn’s light and succulent sticky toffee sponge was topped with a salted caramel buttercream. It was a wonderful combination as the saltiness cut through the richness and danced around your mouth. Rosalyn judged the salt perfectly and it gave a classic a modern twist – very clever! 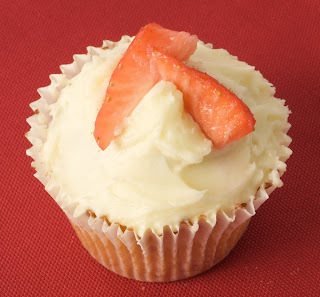 Pippa’s peach sponge was topped with mascarpone icing and strawberries. 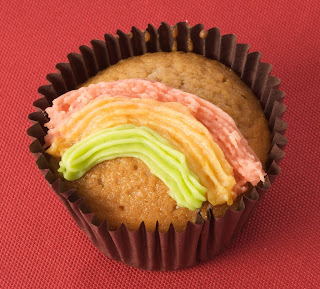 The whole taste was light and fresh and this cupcake scored Max’s second “gorgeous” of the night! I was particularly impressed with the mascarpone icing – it was very clean tasting and effective; I can see it working well with all fruits. 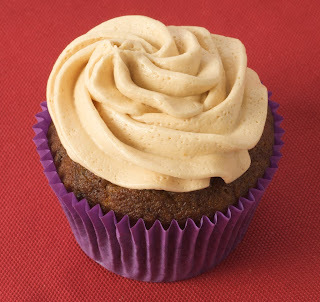 First off, let’s all “ahhhh” at the pretty star shape of Araminta’s cupcakes! I really liked the balance Araminta got into her lemon – it was tangy and citrus but not at all sharp. 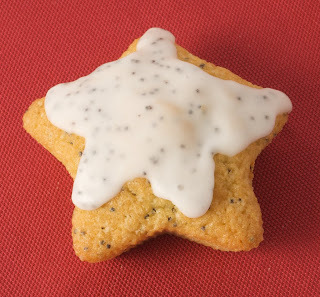 The crunchy poppy seeds added lovely texture. This was a classic combination executed perfectly; as Ying, my co-eater said “these are pure tasting and effective”! Mara’s cupcakes reminded me of my youth spent guzzling fruity sherbet (in truth, there would also be an adulthood spent guzzling fruity sherbet if I knew where to buy it!) The orange, raspberry and lime flavours really packed a punch, the lime being the standout flavour, and the sponge was coloured three ways to match the frosting rainbow. 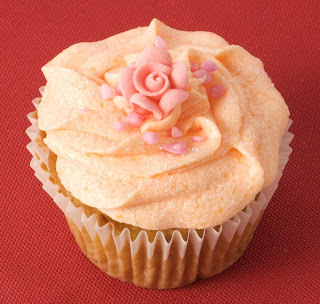 Alix’s vegan cupcake comprised of a peach and rosewater sponge filled with “drunken” peach compote and a rose and peach frosting. These had a heady, exotic flavour and the two elements remained distinct whilst complimenting each other. This cupcake was an eye opener for me as I’m not usually mad on rosewater but I thought these were beautiful (in taste and look!) – also, kudos for name-checking a Kinks song! 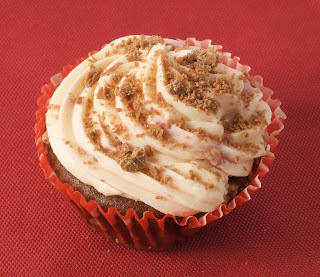 Kerryn made a little sponge sandwich of her cupcake tapping into that other trendy item of baked goods: the whoopee pie. The passionfruit sponge was sandwiched by cream and passionfruit coulis and the top sponge had a generous sprinkling of coconut. 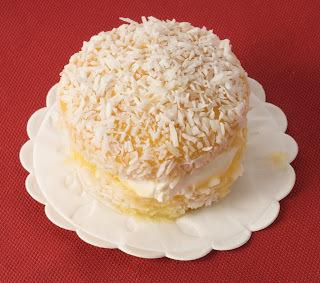 The tropical taste worked very well with the cream and soft sponge….and bonus points if you noticed that Kerryn served each one on a tiny doily! 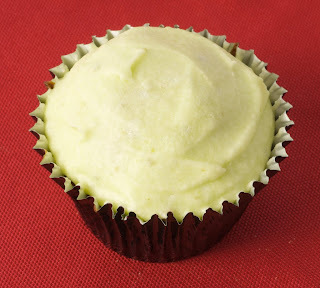 Rosella teamed her lemon sponge with a tangy lime frosting and the flavours were clean and fresh in your mouth. 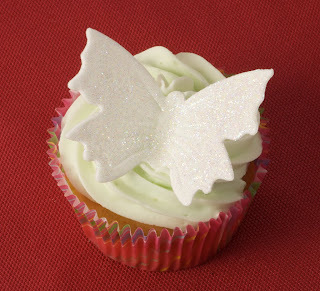 Special mention has to go to the beautiful sugarpaste butterflies Rosella made; the angle of the wings and the dusting of glitter made them look very special indeed. Kyra went for a classic combination and it worked so well. The rhubarb hit first with it’s acidic tang and then the warmth of the ginger slowly came through and built in your mouth. 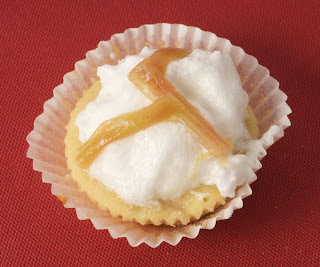 I loved the simple swirl of frosting and the tiny pieced of rhubarb on top. Our defending champion created a wonderful black forest with cocoa rich chocolate sponge, black cherry preserve, fresh cream, chocolate flakes and black cherries. The richness of the sponge and the lightness of the cream was divine and the cherry flavour came through after leaving a lovely fruitiness in your mouth. 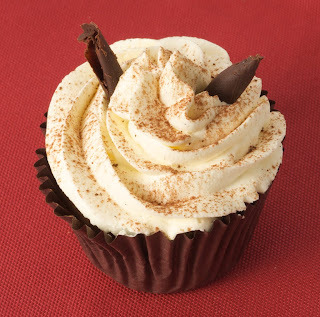 I’m a big fan of Shelley’s cupcakes and particularly love the way she always makes at least two flavours! 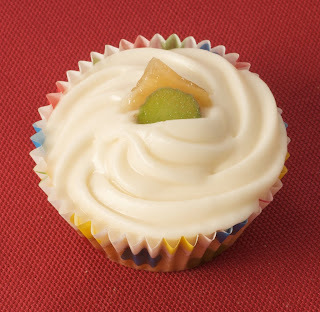 Her second offering was this perfect looking key lime cupcake. The lime and almond sponge was absolutely dreamy – so moist and flavoursome and the light lime frosting tasted as wonderful as it looked. Carlo struck me as an extremely modest chap – when I asked him if he was entering our professional or amateur competition he replied, “very amateur”, but as you will see from the photo that’s not the case! Carlo left the rhubarb tart and I like the acidic zing that gives to a cake. His light and frothy meringue topping perfectly partnered the sharp fruit. So, that’s all the amateur entries (I always feel bad calling them ‘amateur’ when the quality, skill and talent is so awesome)…now let’s look at what the professionals served up…. Shaz’s ethos is to produce healthier baked goods. That means less fat, salt and sugar but without compromising on flavour. 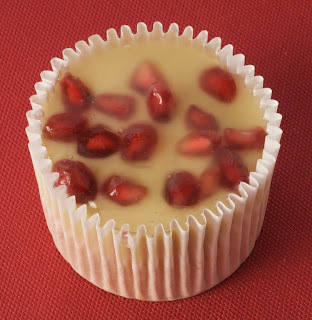 These lemon and vanilla cupcakes were topped with either glazed pomegranate seeds or blueberries. The textures were incredibly light and the fruit tasted fresh and…I’m going to say it….healthy! 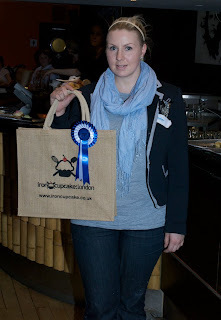 Mellissa is not only a previous ICL winner, but she is also Ms Cupcake (you can find her at Greenwich Market) and has appeared on TV spreading her message that vegan cupcakes needn’t compromise on taste or texture! . 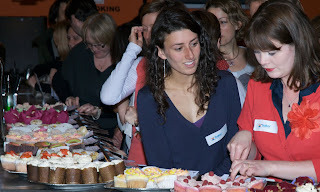 In fact, she’s so successful at spreading the word (I guess people are more willing to listen when you’re offering them amazing cupcakes!) that she’s inundated with work and needs help. Mellissa is looking for part time (at the moment – who knows where it might lead?) paid help. 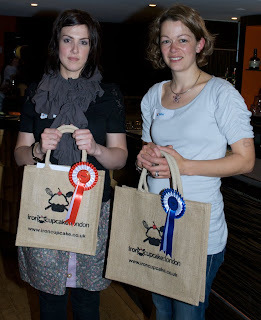 Anyone with a talent for baking can apply via her website (or email directly: info@mscupcake.co.uk) . 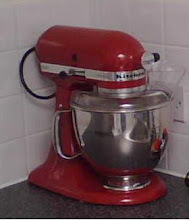 The work isn’t limited to cupcakes but all baking – cakes, brownies, biscuits etc. 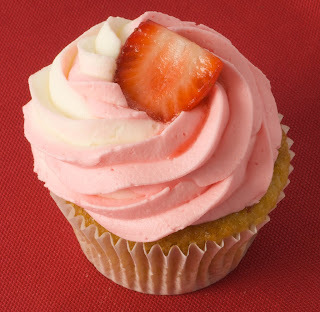 Ok job advert over….this cupcake was intensely strawberry. It contained both dried and fresh strawberry in the sponge and then strawberry jam between the sponge and vanilla strawberry frosting. I love the two tone effect in the buttercream. Chris works under the name of Lily Bean Cakes and can be found under that name on facebook. 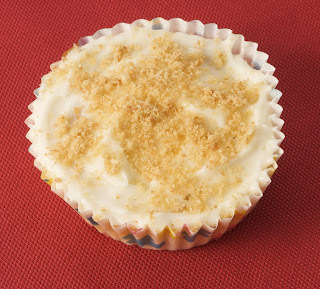 Her pineapple and coconut sponge was basted with a pineapple and rum syrup and topped with coconut buttercream. Need I point out how heavenly this was? The flavours were sweet and tropical and the rum a subtle background flavour. The simple dried pineapple decoration alongside the pretty flower was perfect. Loved it! Janelle works under the name of Jamoisie Sweet she explained that it’s a combination of Jamaican and Aussie! Her vegan cupcakes are available from Greenwich Market. The sticky date sponge was ultra moist and had a pleasing smoky quality to it that added real depth of flavour. 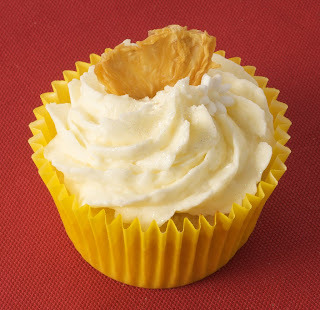 Janelle’s second entry of the night was this dinky lemon cupcake. The flavour was intense – so tangy and fresh. The tiny flower decorations were adorable and finished off the cute look. That concludes the entries for our tenth challenge; I’m sure several will have caught your eye. Once again, I have to comment on the sheer quality and imagination of our bakers – every month it’s like walking into the world’s greatest cupcake parlour and being allowed to eat EVERYTHING! Special thanks to my awesome team of helpers who make the event run so smoothly on the night: Paul, Dave, Tina, Ying and Max – thanks. I couldn’t do it without you. All photos are the property of Dave Shipman and are reproduced here with his kind permission. If you wish to use any of his photos please can you email me first for permission – thanks. 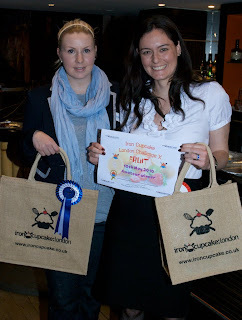 Hope to see you all again on Monday 7 June for our first birthday; the theme is CELEBRATION! Fabulous write up and great pics. I tried to get photos of them all but some of them came out a bit wonky! Once again thanks for such a nice welcome to your fab event, kicking myself I've left it so long to come along! Shall be there in June! So my question is how do you become a tester at one of these amazing shows? They all look amazing it must have truly been hard to chose a winner! You guys in London sure know how to do a cupcake. I love all of the cupcakes! Congratulations to everyone for such amazing entries this month and a special thanks to Samantha and her team again for all of their hard work in running the event! what fantastic entries! 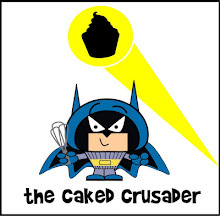 i am really needing a cupcake now! Gosh, everyone is so inventive - they all look and sound wonderful and I want to try every single one! 70th birthday cake – for twins!